Teeming with natural wonders, Croatia is famed for its jaw-dropping landscapes, medieval architecture and dazzling shores. Over 1200 islands and islets speckle the azure waters of the Adriatic Sea, glistening in over 2715 hours of sunshine a year! Add sea caves, craggy coves, golden sands and white pebbles to the mix, and you'll soon see Dalmatia is blessed with one of Europe's most dramatic coastlines. 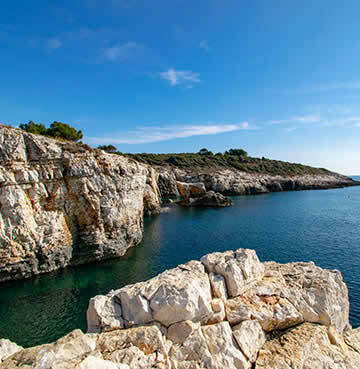 Grab your towel, sun glasses and swimsuits and head to some of the best beaches in Croatia with the help of this handy guide. Translating to 'golden horn' – clue's in the name with this one! 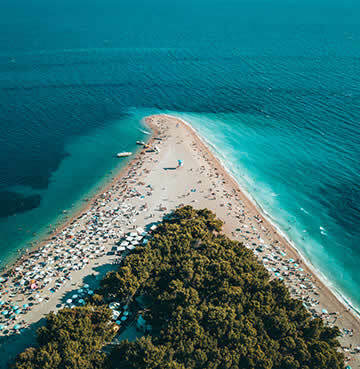 The most photographed beach in all of Croatia, Zlatni Rat is a picturesque postcard paradise and every bit as swoon worthy as you might imagine. Sitting pretty on the beautiful island of Brac, a small tongue of tiny golden pebbles stretch out into the sapphire sea. Constantly changing shape and colour thanks to winds and tides, Mother Nature never tires of crafting this coastal sweet spot. Great news for windsurfing enthusiasts who can make the most of the area's thermic winds! If you prefer life beneath the waves instead of on top, take a dive on the wild side and meet the local fishy residents. Hailed as heaven for snorkelers, the seabed shelves away quickly to reveal an underwater world just waiting to be explored. After a long day of blissful beach lounging under a bright blue sky, you might be thinking 'does it get any better than this?' At Zlatni Rat, it does. Pulling out all the stops for the finale, watch in awe as the sun meets the horizon in a blaze of golden brilliance. Backed by fragrant pines, it's a feast for the eyes and the nose! Zlatni Rat may be a tough act to follow, but you can count on Kamenjak National Park not to disappoint. A short car ride from Pula, you'll find these stunning shores at the southernmost tip of Istria's heart shaped peninsula. Over 30km of striking coastline is yours to explore, with countless coves and beautiful bays along the way. Sweeping hills are accessorized with wild flowers, rolling down to rocky cliff terraces that overlook crystal clear waters. Here you'll find the perfect perch for watching dolphins. As you scan the waves in search of the playful porpoise you might even be lucky enough to spy a rare monk seal! Nature lovers will relish the rugged landscape, criss-crossed with trails leading to hidden treasures – a highlight being the 'dinosaur path', complete with actual fossilized steps! The park's protected status keeps it pristine, so whichever cove you settle on for your beach pit stop, you can guarantee it'll be glorious. A stone's throw from the 'pearl of the Adriatic' lies this often-overlooked slice of paradise. 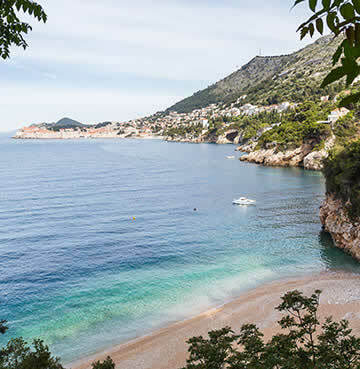 Jump in the car and cruise the Dubrovnik Riviera to jaw-dropping Sveti Jakov – one of the region's best kept secrets. If you're craving an afternoon of solitude, this pebble and sand treasure is just what the doctor ordered. Tucked away into a cliffside, there's a small staircase that takes you onto the beach. Boasting panoramic views across Old Town and Lokrum island, its secluded position means you'll only have to share it with a select few. Brilliant blue hues peacock into gorgeous greens as the sun glitters on the seas surface. Hypnotic waves gently caress the smooth stones along the shore and invite you to cool off in their refreshing waters – you can just imagine how sensational the snorkelling is here! Be sure to stick around for another sunset masterpiece, with Dubrovnik's infamous Old Town parading in silhouette form. Family fun times are a shore thing at Split's sandy Bačvice beach. A firm favourite among locals and tourists alike, you'll find this buzzing city beach right in the centre of town. Easily reachable on foot, it's the perfect way to wind down after a long day of seeing Split's historic attractions. Bačvice's gently sloping sands are a match made in heaven for little water babies, who can happily play in the shallows without any danger of a sudden drop off. With facilities at your fingertips, you needn't worry about packing a picnic – there's a whole host of cafés and restaurants to satisfy any hungry tummies. As well as countless cocktail bars to treat yourself to a holiday tipple (or two). The beach is the birth place of the traditional Croatian game of Picigin. Protected as a cultural heritage, Split is widely considered to be Picigin's spiritual home. The aim is to keep a small ball from making contact with the water, and you'll undoubtedly see locals sprinting across the shallow seabed in a heroic effort to keep the tiny sphere in the air as long as possible! If the Pakleni islands don't make it onto your bucket (and spade) list, then nothing will! Just a short boat ride from heavenly Hvar, this chain of isles are pure Mediterranean magic. Attracting sailors, sun-seekers and snorkelers – there's a beach for every kind of holidaymaker. Between secluded bays, deserted lagoons, craggy coves and sun-drenched hills, these idyllic islands are bound to offer up a dreamy Dalmatia day out. If you're looking to sail away for some much needed seclusion, head to Vlaka and the quiet of its glistening bay. With all your beach essentials in tow, set up camp for the day amidst the verdant vineyards and roman ruins that make this blissful beach so unique. Those in the know claim the bay's mud works wonders as a skin treatment, so don't be too surprised if you see locals lathering it all over themselves. If you're feeling brave, why not try it out for yourself? One of the oldest and most sought after seaside spots is pretty Palmizana. Framed by a fragrant pine forest, the trees offer up plenty of shade on a hot summer's day – as does the invitingly refreshing water lapping at the shore. Sea-kayaking is a popular pastime in the area, and as you glide through the shimmering turquoise tones you'll see why! One thing's for sure, whichever little slice of paradise you pick in the Pakleni islands – you'll never want to leave. Once you've got your vitamin sea fix, discover a wealth of things to do beyond Croatia's beautiful beaches. From the fortified walled wonder of Dubrovnik to Istria's hilltop hamlets – there's never a dull moment in this Mediterranean marvel.